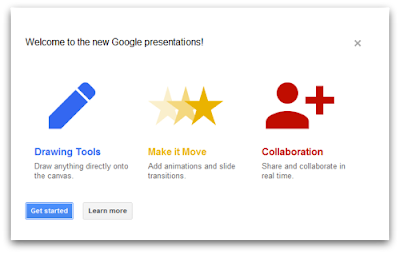 Have you noticed the great new features in Google Docs Presentations? Google has recently added a few new features to Presentations that include drawing tools, animations, and enhanced collaboration. Let's take a closer look at these exciting new features below! Users now have the ability to create diagrams, charts, and flowcharts within a presentation. 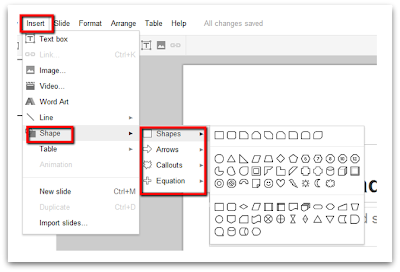 To access these new drawing tool functions simply click on 'Insert' and then click on 'Shapes.' 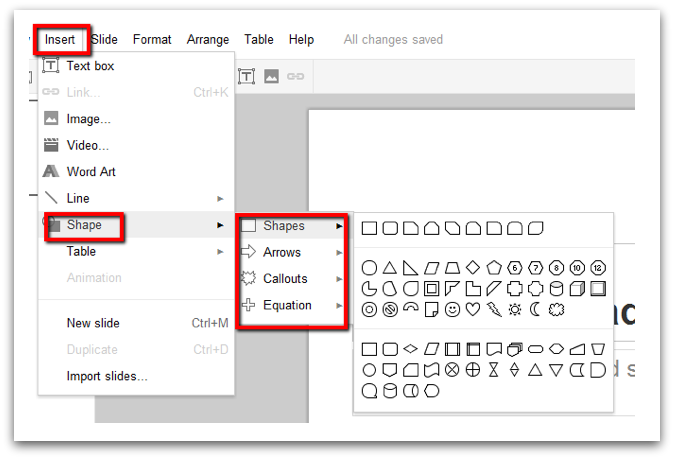 Here, you have the option to add shapes, arrows, callouts, and equations. This new feature will help users bring visual emphasis to topics. Your audience will certainly enjoy and appreciate this particular feature! Add a little flavor to your presentation with new animations! These animations include slide transitions and animations within the slide. 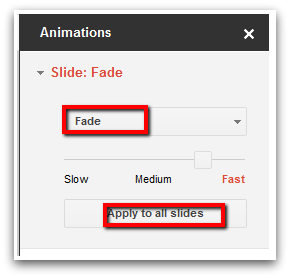 This feature will surely improve the quality of your slides and bring your presentation to life. *If the animations selection is grayed out in the selections list, you must select the slide or text field. The animations feature will be displayed on the right of the screen and you will now have the ability to animate any slide or object. Use the drop down menu to make specific animation selections. As an example, we chose to use the 'Fade' option on a slide. You will see that you also have the ability to manipulate the speed of the preferred animation. 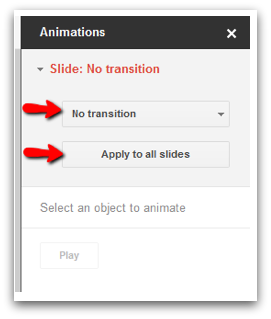 The slide animation will be placed on the selected slide unless you choose to 'Apply to all Slides' option. Similar to slide animations, users also have the ability to animate objects within the presentation. This includes text and pictures. Utilizing this feature is sure to bring your presentation to life and WOW your audience! Do you enjoy the character-by-character collaboration that is available in a Google Doc? Well, now this same feature is available in Google Presentations. Character-by-character collaboration allows multiple users to both view and edit the same presentation in real time. You will automatically see updates as multiple users edit the existing presentation. Simply share your presentation with other individuals to co-create together. You also have the ability to have a chat session within the presentation (just like a Google Doc). Below we have a presentation that provides us with a sneak peek of the new features .... enjoy! Now that you have learned what the new Google Presentation features include, below are some tips to create highly effective presentations. Less is More: Don't overload your slides with diagrams. Instead, space them out over various slides to help your audience follow the topic of your presentation. Consistency: Although Google Presentations has multiple transition and animation features now available, try to keep some consistency throughout a single presentation. It is recommended that you stick to one or two transitions throughout your entire presentation. These features keep your audience engaged but steer clear of animation over use. You want your audience to focus on the topic, not the sporadic use of transitions. Exploration: Try out these new features! Even if you are not a 'heavy' Google Presentation user, log in to Google Docs and see what you can create and have fun with! Are you as excited as we are about these new features? Let us know i the comments section below!